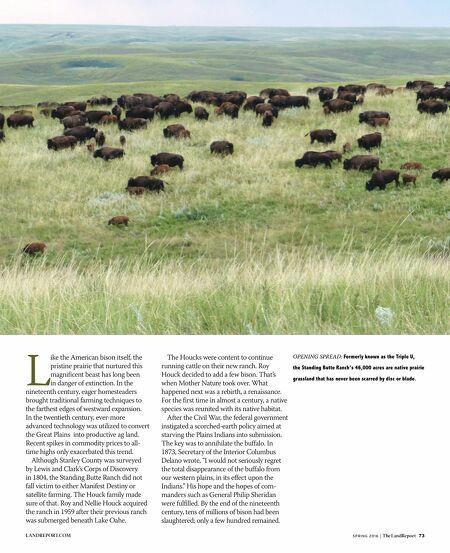 S P R I N G 2 0 1 6 | The LandReport 73 LANDREPORT.COM L ike the American bison itself, the pristine prairie that nurtured this magnificent beast has long been in danger of extinction. In the nineteenth century, eager homesteaders brought traditional farming techniques to the farthest edges of westward expansion. In the twentieth century, ever-more advanced technology was utilized to convert the Great Plains into productive ag land. Recent spikes in commodity prices to all- time highs only exacerbated this trend. Although Stanley County was surveyed by Lewis and Clark's Corps of Discovery in 1804, the Standing Butte Ranch did not fall victim to either Manifest Destiny or satellite farming. The Houck family made sure of that. Roy and Nellie Houck acquired the ranch in 1959 after their previous ranch was submerged beneath Lake Oahe. The Houcks were content to continue running cattle on their new ranch. Roy Houck decided to add a few bison. That's when Mother Nature took over. What happened next was a rebirth, a renaissance. For the first time in almost a century, a native species was reunited with its native habitat. After the Civil War, the federal government instigated a scorched-earth policy aimed at starving the Plains Indians into submission. The key was to annihilate the buffalo. In 1873, Secretary of the Interior Columbus Delano wrote, "I would not seriously regret the total disappearance of the buffalo from our western plains, in its effect upon the Indians." His hope and the hopes of com- manders such as General Philip Sheridan were fulfilled. By the end of the nineteenth century, tens of millions of bison had been slaughtered; only a few hundred remained. 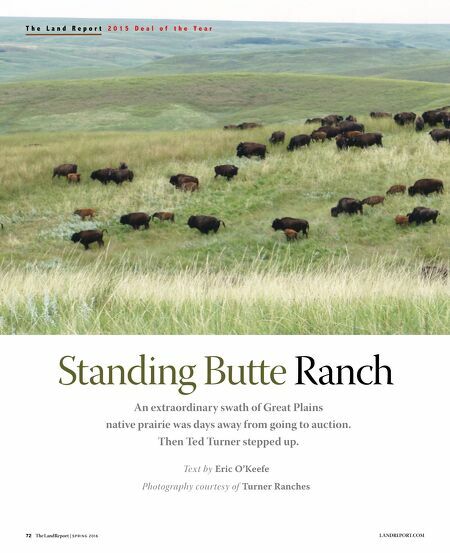 OPENING SPREAD: Formerly known as the Triple U, the Standing Butte Ranch's 46,000 acres are native prairie grassland that has never been scarred by disc or blade.